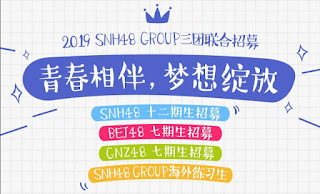 SNH48 GROUP now has only three groups left, namely SNH48 (Shanghai), BEJ48 (Beijing), and GNZ48 (Guangzhou). The SHY48 (Shenyang) and CKG48 (Chongqing) group sisters were officially disbanded at the SNH48 5th Request Time Best 50 concert. For the group's progress at that time, SNH48 GROUP opened an audition to look for superior seeds for the three remaining groups. This audition is for the twelfth generation SNH48, seventh generation BEJ48 and GNZ48. 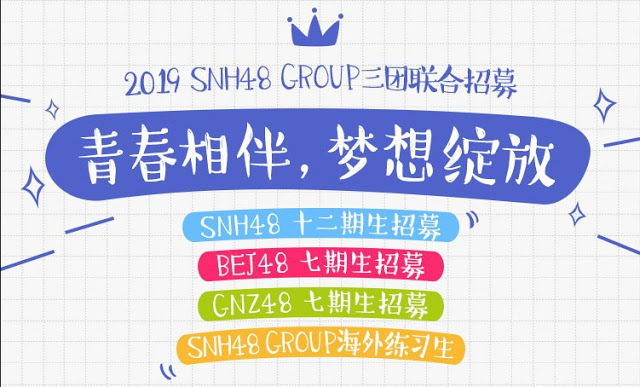 Phase one is the application has been opened on the SNH48 website and will take place from January 19 to March 20 2018. It has also been opened for the SNH48 trainee program for overseas girls who wish to register for SNH48 GROUP. All elected members will have the opportunity to travel abroad for approximately two years. As for the conditions that must be fulfilled to become a member of SNH48 GROUP. (1) Ages 13-22 years old, especially trainee programs from abroad must be 13-18 years old. (2) Not bound by a contract with any company, willing to sign an exclusive contract for SNH48 artists. (3) If elected, willing to conduct training, performing arts, performing in the theater, playing movies / drama, and participating in other commercial activities. In addition, the salaries of SNH48 GROUP members can reach USD 100k per month and at least USD 1500 per month depending on performance and popularity. Besides SNH48 activity, members usually gets side job like hosted the TV Program, CM, and magazine.